Kamen Rider (the Masked Rider) is a popular Japanese hero among the children seen on TV, its series of the program has still been broadcasting today. The first program “the Kamen Rider” started around 40 years ago from now, in April in 1971. 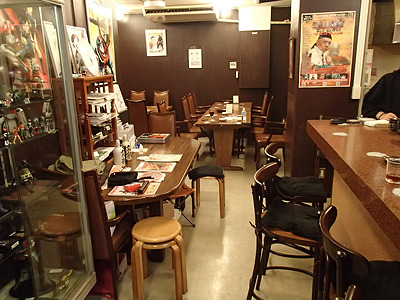 The writer of this article heard one day that there is an Izakaya (Japanese-style bar) in Tokyo, its owner is a man who played the character of “Hayato Ichimonji”, who transforms himself into the “Kamen Rider 2” on the program. The name of the izakaya is “Battamon”. The izakaya is in Itabashi ward in Tokyo. It takes only a 5-minute walk from Oyama station, which is 3rd station from Ikebukuro station on Tobu Tojo line. It’s in the basement of a building, you can find a signboard in front of the building like this photo. 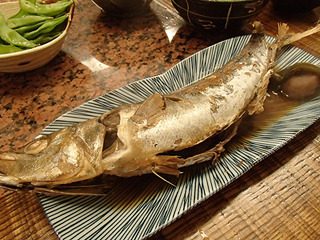 The name of the izakaya is “Battamon”, “Batta” means locust. Kamen Rider is set up that he has the ability of locust, probably the name comes from that. This is Mr. Tsuyoshi Sasaki, the former Kamen Rider 2. 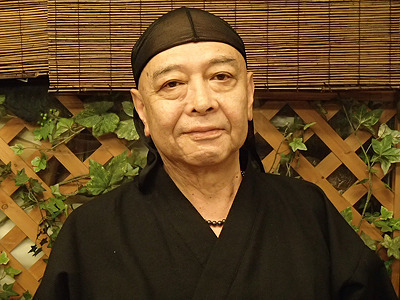 He is the former “Kamen Rider 2”, an owner of “Battamon”. He has played many other roles as an actor as well, he is still continuing his acting activities, operating this bar. Look at his keen-eyed face! Probably he can still beat monsters or other enemies as a hero (or a Ninja?). This is inside the bar. 4 tables and 5 seats on the counter. It didn’t look too wide actually because many items related with the hero were decorated on the wall and in some shelves. There are many izakayas and cafes related with manga or hero character like this at Akihabara or Shinjuku area, it’s kind of rare in this Itabashi area. A lot of valuable posters and autographs were decorated anywhere. Some well-known celebrities often manage a restaurant or shop with its famous name, having other person to operate those, but the former Kamen Rider 2 manages and operates himself, even cooks and serves the meals to the customers. 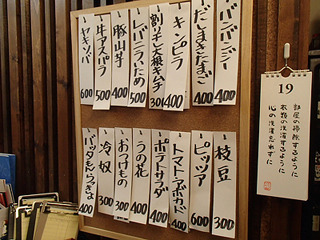 Sometimes he talks with the customers about untold stories for shooting of Kamen Rider 2. Menus with the common touch. Boiled fish with Japanese plums. 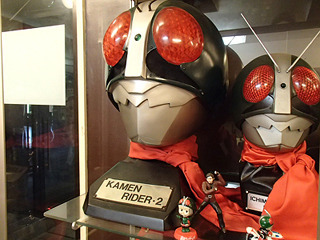 Many of the customers are big fan of Kamen Rider series in wide range of ages. Some of them watched the program on TV on time when they were young, and some of them became a fan recently seeing DVDs. You can see any DVDs for free. Choose one of those and enjoy. 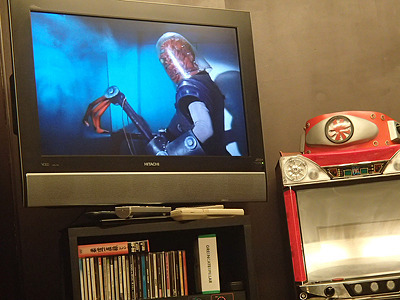 There were many DVDs of Kamen Rider series, the customers can see any of them freely. This is definitely a fantastic place for big fans. It’s really understandable they would likely to overstay here. 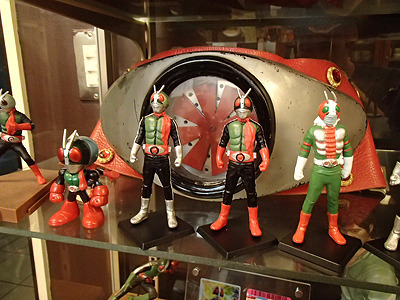 Kamen Rider 1, 2, V3, and waist belt in the showcase. “Each of these are one of a kind, created by a famous figure creator.” the owner said. 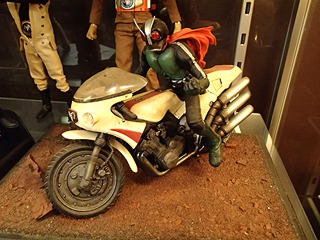 Kamen Rider on the bike. 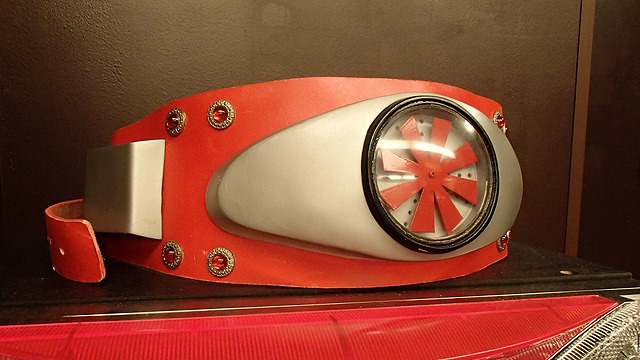 This is a mask of Kamen Rider 2. Some of them looked old, but all of them are one of a kind valuable treasures for big fans. You can get a autograph from the former Kamen Rider 2. 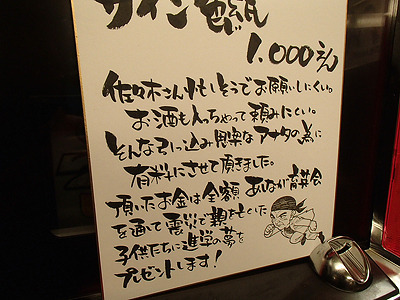 This says that it costs 1,000 yen (US$12.7) for his autograph, but this 1,000 yen would be donated to the children who suffered from the Huge Earthquake and lost their parents. 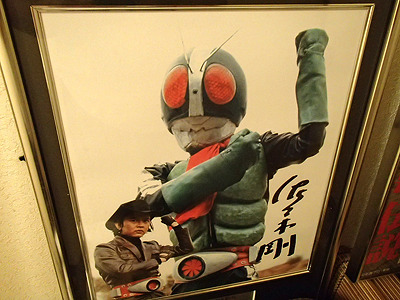 The former Kamen Rider 2 is now over 60 years old, but he is still a hero who saves the children’s future. “The important thing is not how long you live, but how well you live.” the hero says. He is still working on a acting activities, and now preparing for a next shooting. So you will be able to see him acting on a movie in the near future. Look forward to seeing the hero. Now we have seen the life of the former Kamen Rider 2. What do you think? 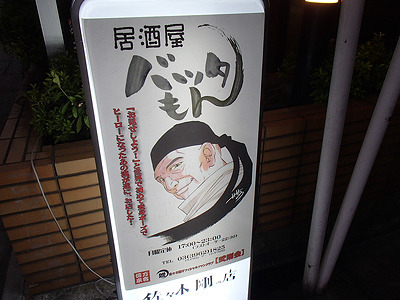 You can see the hero at “Battamon” in Itabashi ward in Tokyo, and also you can see him on a movie soon. 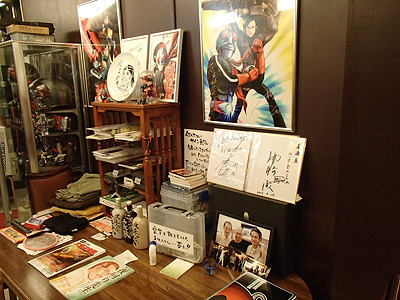 I would like to go there someday, and have his thoughtful meals, talking with him and seeing Kamen Rider’s movies.